The worst kept-secret regarding Fernando Alonso joining the Scuderia has been finally confirmed. The Spaniard will replace Kimi Raikkonen at Ferrari from 2010, signing a new three-year deal. The double world champion’s move from Renault has been anticipated for many months, and will see him paired with Felipe Massa in the Italian race team. “We are very proud to welcome to our team another winning driver, who has demonstrated his amazing talent by winning two world championships in his career to date,” said Ferrari team boss Stefano Domenicali. Alonso’s arrival means Raikkonen is likely to make a return to his former team McLaren with Lewis Hamilton as his new team-mate next season. The Finn delivered the world championship for the Scuderia in his first season with the team back in 2007, but his results have declined since and he will leave the squad a year before his contract had been set to expire. “Of course, we wish to thank Kimi for everything he has done during his time with Ferrari,” said Domenicali. “In his first year with us, he managed to win the drivers’ title, thus making his contribution to Ferrari’s history and he played a vital role in our taking of the constructors’ title in 2007 and 2008. Raikkonen underlined that his departure from Ferrari had been by mutual consent. “With common consent, we have agreed to terminate the contract binding me to Ferrari to the end of 2010, one year ahead of schedule,” he said. “I am very sad to be leaving a team with which I have spent three fantastic years, during which time I won plenty of races. Alonso’s confirmation at Ferrari will trigger off a series of driver announcements over the coming days for the 2010 season. Lewis Hamilton took his second Grand Prix victory of the season with a faultless display of racing under the lights at Singapore. Toyota’s Timo Glock finished in an impressive second with last year’s winner Fernando Alonso third for Renault. As for Sebastian Vettel, who had the opportunity to challenge the race win with Hamilton, the Red Bull driver was disappointed to come home in fourth. That penalty in which he was caught speeding in the pitlane and that moment on the kerbs, which damaged his double diffuser while chasing the leading McLaren, means the German is now out of contention for the championship. Jenson Button was able to recover from his mid-field starting position to record a fifth place finish, which is crucial as the season reaches its conclusion. Brawn team-mate Rubens Barrichello struggled with brake wear and could only manage sixth. By finishing in fifth, Jenson extends his lead in the drivers’ standings ahead of Rubens by 15 points. With only three races left, the Brawn GP driver is looking odds on in taking that elusive title. In fact, Jenson Button could actually win the drivers’ title in the following race at Suzuka in a week’s time if he takes five more off Barrichello. 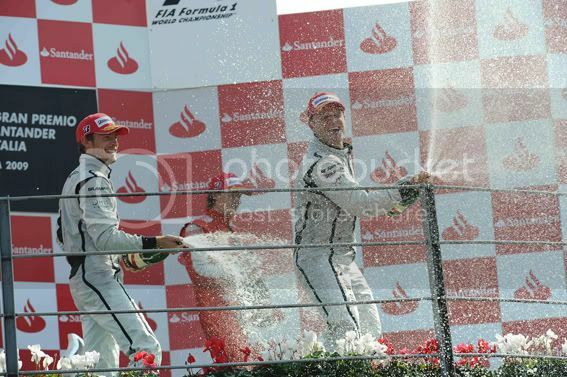 Heikki Kovalainen came home seventh for McLaren with Robert Kubica taking the remaining point finish for BMW Sauber. It was a frustrating race for Nico Rosberg, who made a great start on the opening lap to pass Vettel, but that moment leaving the pitlane after his first stop, in which the Williams driver ran off the track meant he had to serve a drive-through penalty for crossing the white line. 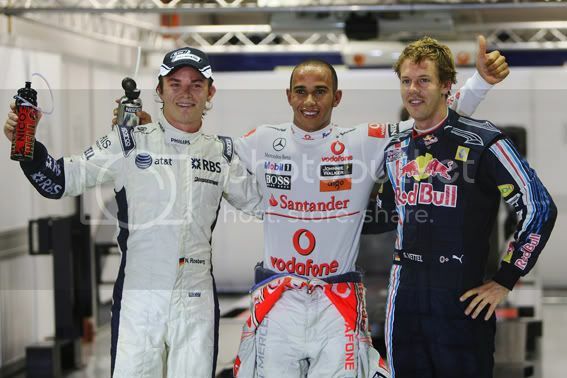 Without that, Rosberg would have achieved a solid result for Williams at the Singapore Grand Prix. The same can be said to the Red Bull-sponsored teams with both Toro Rosso out on the same lap with separate mechanical problems while Mark Webber crashed at Turn 1 with brake problems 15 laps from the chequered flag. Only Vettel was able to record a points finish with fourth. Though the margin of 25 points behind championship leader Button means Vettel’s chances to overhaul his title rival is now over. Ferrari had an anonymous race, with Kimi Raikkonen chasing Kubica and Kazuki Nakajima (Williams) home in P10 ahead of the delayed Rosberg, and Giancarlo Fisichella P13 after a race-long duel with his Force India replacement Tonio Liuzzi. While Glock achieved his best-ever result with a podium finish, his Toyota team-mate Jarno Trulli compounded his poor qualifying with a poor start and only finished P12. The second running of Formula One’s night-race at Marina Bay didn’t deliver in terms of on-track action bar drive-through penalties and a safety car period when Adrian Sutil colliding into Nick Heidfeld after a desperate bid to pass Jaime Alguersuari. But in terms of the championship, for both the drivers’ and constructors’, this race has played a significant pact. Suzuka is the next event in this dramatic season of Formula One racing. 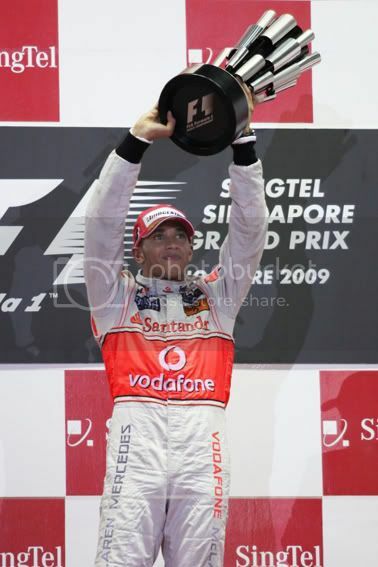 Will we see Jenson Button crown champion next Sunday? Following this great recovery drive, he is the favourite to take the honour over current champion Lewis Hamilton, the winner of the Singapore Grand Prix. Next race: Japanese Grand Prix, Suzuka. October 2-4. Defending champion Lewis Hamilton took his third pole position of the season in Singapore, as title contender Rubens Barrichello brought an early end to qualifying following a crash. The Brawn GP driver, who had a gearbox change before the session, held fifth on the provisional grid before shunting heavily against the barriers at turn five. With the penalty applied, the Brazilian will start the Singapore Grand Prix in tenth, just two places ahead of his team-mate Jenson Button. Series leader Button seemed to be struggling with a lack of balance in the BGP-001, with understeer his main complaint. To qualify outside the top ten at this crucial point of the season was not ideal and it will be interesting if he can avoid trouble on the opening laps following this low grid position. The last time Button started a race in the mid-field resulted in a retirement at Spa-Francorchamps. Sebastian Vettel kept his and Red Bull Racing’s title hopes alive as he joined Hamilton on the front row. The German will be particular encouraged as his title rivals from the Brawn squad could only manage P10 and P12 on the grid. Nico Rosberg achieved his career-best qualifying result with third for Williams. He even set the quickest lap time of the weekend around the demanding 3.148-mile street circuit with one minute, 46.197 seconds – which was set in Q2. Red Bull Racing’s Mark Webber completes the second row, with last year’s winner Fernando Alonso fifth for Renault followed by the Toyota of Timo Glock. The BMW Saubers of Nick Heidfeld and Robert Kubica take up row four, ahead of Heikki Kovalainen’s McLaren. As for Ferrari, the team predicted it will be a difficult weekend and so it proved as Kimi Raikkonen could only manage P13 while Giancarlo Fisichella continues to struggle with P18 the best he could achieve. This result marked the first time all season that the Scuderia had failed to get into the top ten. Kazuki Nakajima (Williams) and Jarno Trulli (Toyota) were both a long way off their respective team-mates and ended up P11 and P15 respectively. The return to a high downforce circuit meant the end of the fairytale for Force India. After recent front row performances, the team had to settle for P16 and P20 for Adrian Sutil and Tonio Liuzzi. Sebastien Buemi was the only one of the three rookies to get into Q2, taking a solid P14. His Toro Rosso team-mate Jaime Alguersuari will start three places behind, while Romain Grosjean’s troubled weekend continues with issues over his brakes. The Renault driver will start his first night-time Grand Prix in a disappointing P19. The Renault F1 team has announced that managing director Flavio Briatore and engineering director Pat Symonds have parted company with the team and that it will “not dispute” the allegations of race-fixing when it appears before the World Motor Sport Council on September 21. The team had been accused of asking racing driver Nelson Piquet Jr to crash deliberately during last year’s Singapore Grand Prix in order to cause a safety car period that would work to his team-mate Fernando Alonso’s advantage. The Spaniard went on to win the race. Renault were due to appear before the World Motor Sport Council next week to discuss what penalties should be imposed on the team as a result of the crash. 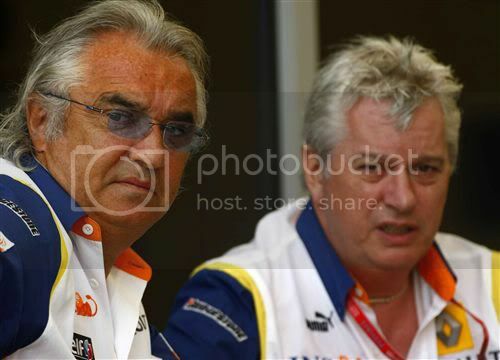 “It also wishes to state that its managing director, Flavio Briatore and its executive director of engineering, Pat Symonds, have left the team. This surprising turn of events has left question marks about the future involvement of the manufacturer. With Briatore and Symonds out, will the team even take part in the remaining four races of this season or quit with immediate effect? The CEO and president of Renault Carlos Ghosn had earlier told L’Equipe that the parent company would not react “in hot blood” to the allegations that were made against the Formula One team. “Above all we don’t want to make a premature judgment one way or the other,” he said. Following the crash, which took place on a part of the circuit where no cranes were available to lift Piquet’s car over the barriers, the safety car was deployed. Alonso was the only driver to have pitted before the incident, and consequently he emerged in the lead after the rest of the field refuelled after the safety car came out. Alonso went on to take the chequered flag at Formula One’s first night race – his first after rejoining the team following a season with McLaren in 2007 – and at a time when Renault were considering quitting the sport because of the huge expense involved at a time when domestic car markets were struggling. Rubens Barrichello took his second victory of the season with a superb display of race pace in the BGP-001 sealing a one-two result for Brawn at Monza. The Brazilian benefitted from a single pitstop strategy and thanks to his consistent laptimes that was faster than his rivals, Rubens earned his third victory at the Italian Grand Prix. By winning the race Barrichello has reduced his team-mate lead in the drivers’ standings to 14 points, with four races remaining. As for Red Bull Racing, this was a disastrous afternoon with only one point scored by Sebastian Vettel. The German was unable to match the Brawns pace in the 53-lap race and eighth position was the best he could manage. His team-mate Mark Webber was forced to retire after a coming together with Robert Kubica’s BMW on the opening lap at the Roggia chicane. That incident has seriously dented the Australian’s chance in the world championship. Ferrari’s Kimi Raikkonen finished in third (his fourth podium result) though the Finn did inherit that podium place on the final lap when Lewis Hamilton lost control of his McLaren at Lesmo. Hamilton was unable to make his two-stop strategy work, despite charging away from the field from pole in the opening stint. The world champion was on course for third ahead of Raikkonen and qualifying hero Sutil until his eleventh hour crash at the first Lesmo, which caused the race to finish behind the safety car. Adrian Sutil came home fourth for Force India with Renault’s Fernando Alonso in fifth. Early race favourite Heikki Kovalainen lost ground in the opening laps and finished in a disappointing sixth. Further back, the struggling Toyotas provided some late race entertainment as Jarno Trulli bounced off Kazuki Nakajima’s Williams at the Rettifilo chicane, and then had a wheel-to-wheel battle with his team-mate Timo Glock while trying to regain momentum. Nakajima survived for tenth, with Glock securing P11 when Trulli went rally crossing through the gravel trying to hold off his team-mate. Jarno finished behind Sebastien Buemi (Toro Rosso) but ahead of Romain Grosjean (Renault) and Nico Rosberg (Williams). 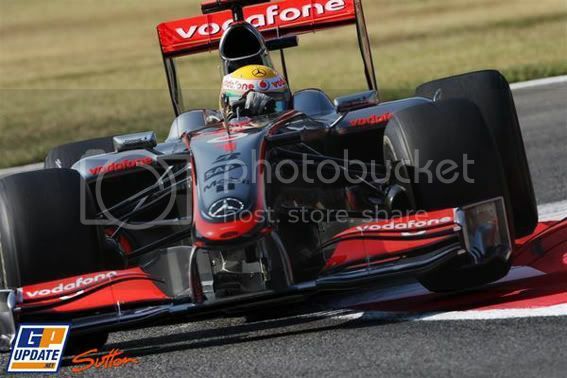 Lewis Hamilton and the McLaren Mercedes team claimed their second pole position of the season at the historical Monza circuit, though the world champion had to dig deep to take the top spot in order to beat Adrian Sutil. Force India continued their good form from Spa-Francorchamps with Sutil earning his best-ever qualifying performance with second position. Initially, Hamilton’s early Q3 time of one minute, 24.605 seconds looked reasonable for pole until Sutil delivered a remarkable lap time with one minute, 24.261 seconds on his final run – despite an error at the first Lesmo. That lap put Adrian onto provisional pole, echoing his former team-mate Giancarlo Fisichella at the Belgian Grand Prix two weeks’ ago. Alas, that dream result for the German and the team was put to one side as Lewis set purple sectors around the 3.6-mile track. The McLaren driver completed the Monza lap to retake pole position with one minute, 24.066 seconds. Despite this, second position is Sutil’s best-ever qualifying performance in Formula One. Although come race day, he has the ominous prospects of two KERS-equipped cars starting right behind him, as Kimi Raikkonen’s Ferrari and Heikki Kovalainen’s McLaren claimed the second row spots. On row three are the Brawns with Rubens Barrichello beating his team-mate Jenson Button by a small margin on 0.015 seconds. Both drivers are looking good for the race as it seems the BGP-001 are adopting an one pitstop strategy compare to their rivals. Tonio Liuzzi backed up Force India’s superb form with seventh position – also a career best – on his return to Formula One after an absence of nearly two years. As for Red Bull Racing, despite the limited amount of running in practice, Sebastian Vettel and Mark Webber will start the Italian Grand Prix in ninth and tenth places, behind Renault’s Fernando Alonso. 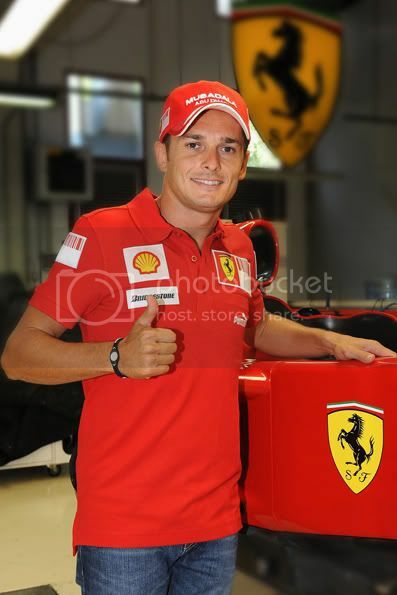 And what about Giancarlo Fisichella? Who is driving for the Scuderia in their home race? Well, the Italian could only manage P14 in a car that has a unique driving style. At least Giancarlo is ahead of the BMW Sauber pair of Robert Kubica and Nick Heidfeld. The pair was forced to pull over with engine problems within minutes of each other during Q2. Williams endured their worst-ever qualifying performance this season with Kazuki Nakajima outpaced Nico Rosberg. The pair will start the race in a disappointing row nine. There was also massive disappointment for Toro Rosso. A year on from its amazing pole and victory, the team will start from the back of the grid, with its lack of pace making P20 qualifier Jaime Alguersuari’s gearbox change penalty irrelevant. 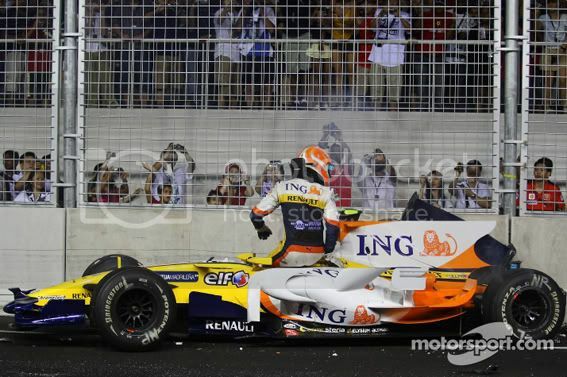 In last year’s Singapore Grand Prix, there has been suggestions that Nelson Piquet Jr deliberately crashed his car in order to help Fernando Alonso win the race. According to Brazilian Formula One journalist Reginaldo Leme, the Renault team ordered Piquet to crash at Turn 17 to benefit his team-mate to win the Grand Prix. Alonso, who along with Rosberg had started on the less favorable super-soft tyres, made his first pit stop. Although he fell to last it proved extraordinarily fortunate timing when his team mate crashed two laps later, Nelson Piquet Jnr backing his car into the wall in front of the grandstands by the Marina. Sure enough, as the other drivers made their pit stops Alonso inherited the lead and won the race. This came a day after qualifying down in 15th due to a car failure. After the meeting with Mr Symonds and Mr Briatore, Mr Symonds took me aside to a quiet corner and, using a map, pointed me to the exact corner of the track where I should crash. This corner was selected because the specific location of the track did not have any cranes that would allow a damaged car to be swiftly lifted off the track, nor did it have any side entrances to the track, which would allow a Safety Marshall to quickly move the damaged car away from the track. Therefore, it was felt that a crash in this specific position would be nearly certain to cause an obstruction on the track, which would thus necessitate the deployment of a safety car in order for the track to be cleared and ensure the safe continuation of the race. During these discussions, no mention was made of any concerns with respect to the security implications of this strategy, either for myself, the public or other drivers. The only comment made in this context was one by Mr Pat Symonds who warned me to ‘be careful, which I took to mean that I should not injure myself. I intentionally caused the crash by letting go of control of the car just before the relevant corner. In order to make sure I would cause the incident during the correct lap, I asked my team several times via the radio to confirm the lap number, which I would not normally do. The FIA will investigate whether the Renault team had fixed the race beforehand with a hearing on Monday, 21st September. As for the team, Pat Symonds refuses to answer several questions about whether they had decided to create a crash. Managing director Flavio Briatore also wishes to state that they have commenced criminal proceedings against Nelson Piquet Junior and Nelson Piquet Senior concerning the making of false allegations and a related attempt to blackmail the team into allowing Mr Piquet Jnr to drive for the remainder of the 2009 season. Question: What could be the penalty if they guilty? Mosley: It could be anything up to disqualification. Because that’s what’s set out in the code. Disqualification means you are out, finished. Question. From the 2008 championship? Mosley: Out. Total. Exclusion forever, gone, finished. That’s the worst that could happen, but don’t for a moment get the impression I’m saying that would happen or will happen. That is the worst that could happen. Whatever the outcome, it will be damaging to the sport and the manufacturer. We will find out the whole consequences in the hearing come Monday, 21st September. Following Giancarlo Fisichella’s impressive performance at the Belgian Grand Prix, in which the 36-year-old qualified the Force India VJM02 on pole position and then recording the best-ever result for the team with a second place finish, Scuderia Ferrari have called for the service of the popular Italian for the upcoming Grand Prix in Monza. Giancarlo will race alongside Kimi Raikkonen for the rest of the season as a replacement driver for the lacklustre Luca Badoer, who struggled in the previous two races. Speaking at Maranello on Thursday, having met team principal Stefano Domenicali and other Ferrari personnel to discuss plans for the Italian Grand Prix, Fisichella was clearly overjoyed at the turn of events – which comes almost 14 years after he tested a Ferrari 412 T2 on September 27, 1995 at Fiorano. “I’m in seventh heaven,” Fisichella told the official Ferrari website. “I still can’t believe it – that the dream of my life comes true, and I want to thank Ferrari and Chairman Luca di Montezemolo. “Over the last week some really incredible things happened to me: the pole position and then second place at Spa and now I’m called by Ferrari to race the last five races of the season for them. Domenicali said he had thought long and hard before opting for Fisichella, and were keen for the Italian to have a long-term relationship with the team. “We chose Giancarlo, because we think that he can make a significant contribution in terms of points during the finale of this uncertain season,” he explained. “Furthermore we considered what could be his role inside the team in the near future, also taking this year’s experiences into account. He will be the reserve driver in 2010. “I want to thank Vijay Mallya and Force India F1 for giving Giancarlo the possibility to cancel his contract in such a happy moment for the team, allowing him to crown his dream as a driver. Fisichella’s appointment comes at the expense of Luca Badoer, who failed to shine during his two-race outing for the team. Although happy about his own position, Fisichella expressed some sympathy for the plight of his fellow Italian. As to who will be racing in the Force India, step forward Vitantonia Liuzzi. The 28-year-old last raced in Formula One for the Toro Rosso team back in 2007, with a sixth place in the Chinese Grand Prix his best result. This new opportunity has come at the perfect time for the Italian as he been on the sidelines no thanks to the limited testing this season. Let’s see if the two Italian drivers will produce the goods in their home race at Monza.